You may know that stress can and does make people sick. But it's not the stress per se that makes you sick. It's how your body responds to the stress. Some people can have a lot of stress and it doesn't affect their health negatively. Others are not so lucky. Even relatively small stressors seriously affect their health. Stress can also ruin your energy. In my book Bursting With Energy, I talk about how that happens. But what if there was an easy and inexpensive way to strengthen your body against the stress it's under? It turns out, there is such a way. Researchers at the Department of Physiology in the All India Institute of Medical Sciences in New Delhi, India decided to test how daily meditation affected the body's response to stress. To do it they took 34 healthy young men and had them play a stressful computer game for 10 minutes. They did this every day for one month. And during the month, they measured the effect of the stress on their bodies in several ways. One way was by measuring their galvanic skin response (GSR). The GSR measures the electrical changes in the skin that happens with stress. (The GSR is what lie detector tests use to determine if you're lying. It can tell if your response is stressing you.) They also measured heart rate, IQ scores, and salivary hydrocortisone (cortisol) levels. It turned out that GSR and heart rate were the best measurements for stress. They were both intensified in every man after playing the computer game. Interestingly, the hydrocortisone levels did not change. Then the researchers had the young men stop playing the game for one month. During this month, they meditated for 15 minutes every day instead. I'll tell you what that means in a minute. Then after this one month meditation break, they went back to playing the game. Only this time, they continued to meditate every day. Here's what the researchers found. Meditation not only significantly reduced the effect of stress on the young men, it also increased their IQs and improved their scores on the game. The authors called the effect of meditation "pronounced." Here are my thoughts about this study. This was a group of young men. 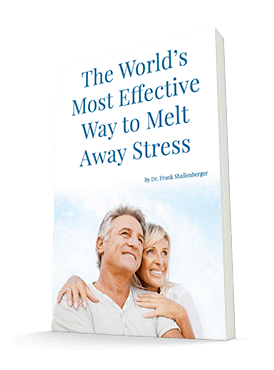 The negative impact of stress is much more of an issue for older folks. That's when insomnia, heart and blood pressure problems, emotional disorders, decreased mental function, and all of the other effects of stress become most notable. So if meditation works well for young people, it ought to have an even greater effect on the over-60 crowd. The other thing that impresses me is that the stress didn't affect their hydrocortisone levels. Many doctors rely on hydrocortisone levels as a good marker for the effect of stress. At least in this study, they were not a good marker at all. Meditation is easy. All you have to do is focus your brain on one thought and one thought only. Each time your brain wanders from this point of focus you bring it back. I have a whole chapter in Bursting With Energy on a special form of meditation called breath meditation. I do believe that everyone over 60 should spend 10-15 minutes every day in this practice. This is especially true for those with stressful lives. REF: Singh Y, Sharma R, Talwar A. Immediate and long-term effects of meditation on acute stress reactivity, cognitive functions, and intelligence. Altern Ther Health Med. 2012 Nov-Dec;18(6):46-53.